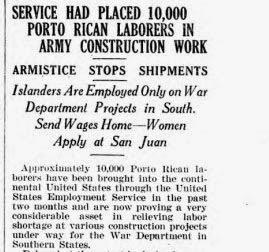 In 1918, the U.S. A. government began recruiting its new Puerto Rican citizens (as of March 1917) as mainland laborers. The idea was to place workers in New York and other states to assist with the shortage of war time in manufacturing, railroad, agriculture, construction, etc. Initially the goal was to register approximately ten thousand people, but that increased to over seventy-five thousand registered Puerto Ricans agreeing to the .35¢ per hour plus military housing/boarding and transportation via military vessels. Your ancestors may have been one of these registered laborers. Like all genealogy research, gather as much data as possible on your ancestor. This information should include full name, sibling’s names, parents, etc. Since names are quite common, determine distinguishing characteristics - occupation, city, nickname, etc. New York National Archives (NARA). The Guide to Puerto Rican Records in the National Archives, New York City, is a great place to begin your Puerto Rican ancestor research. Civil Records. 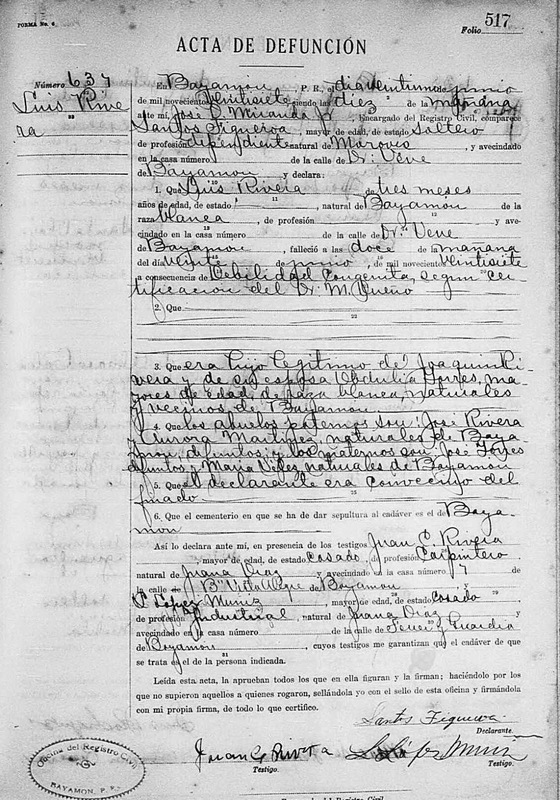 Vital records of births and deaths were recorded, in Spanish at the local Puerto Rican “Oficina del Rigistro Civil.” Visit “Puerto Rico, Civil Registrations, 1885-2001 in the FamilySearch.org catalog or locate in the ancestry.com subscriber database. Newspaper Search. The New York Puerto Rican newspapers reported news of its community. Although much was in Spanish, these OCR digitized copies are easily available with the New York Public Library database resources, or other comprehensive historical/genealogical libraries that hold newspaper database subscriptions (i.e. Midwest Genealogy Center, MO. - library card will get you home access). Military Records. Selective Service System draft Registration Cards, 1917-1918 are digitally available on FamilySearch.org. Consular Records and Passports. Many Puerto Ricans worked in neighboring countries, (i.e. Dominican Republic). For easier entry and exist many applied for their U. S. passports. 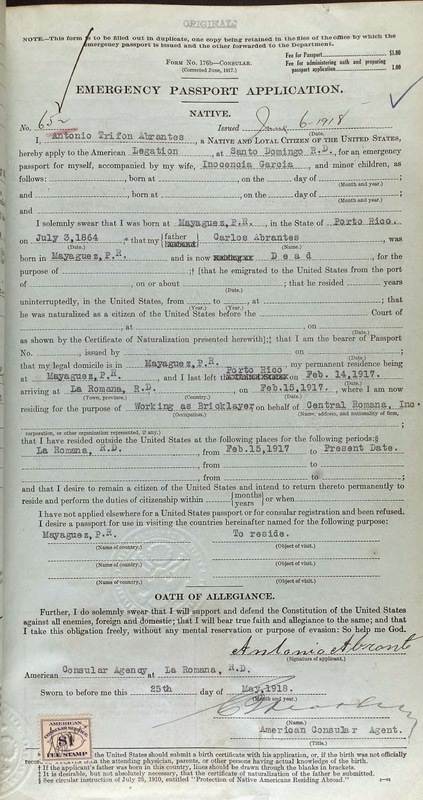 Visit U.S. Passport Applications, 1795-1925 on ancestry.com. For Puerto Rico, this collection holds records from 1907-1925. This is a good place to begin your passport research, but know that more information on Consular Records will be shared in Part II. Thinking of a warm romantic island on this cold Valentine’s Day.